From left: Vivian Lewis, McMaster University Librarian; Mohamed Attalla, AVP and Chief Facilities Officer; Patrick Deane, McMaster President; Nick Griffin, Director, Bertrand Russell Research Centre; Ken Blackwell, Honourary Russell Archivist. 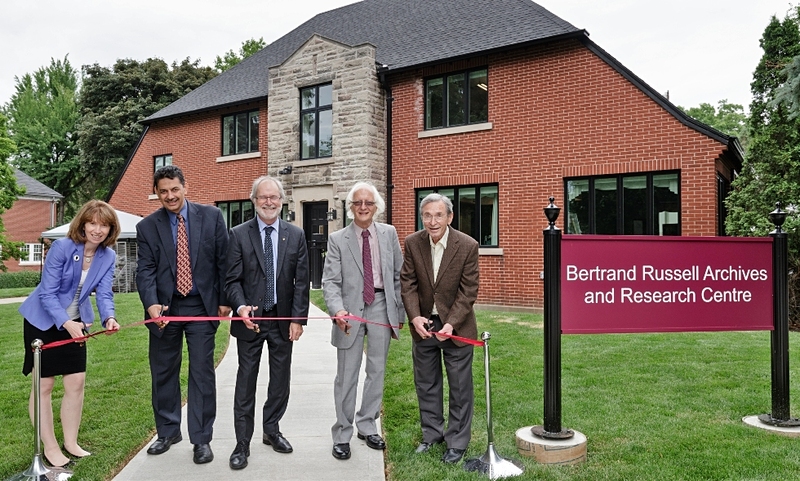 The new home of McMaster’s Bertrand Russell Archives and Bertrand Russell Research Centre has officially opened its doors. McMaster faculty, staff and students, as well as scholars from around the world, recently gathered to celebrate the opening of the Bertrand Russell Archives and Research Centre, a state-of-the-art facility designed to house McMaster’s vast Russell Archives and to support activities related to Russell scholarship. A pacifist, philosopher and Nobel laureate, Russell is widely considered one of the greatest intellectuals of the 20thcentury. 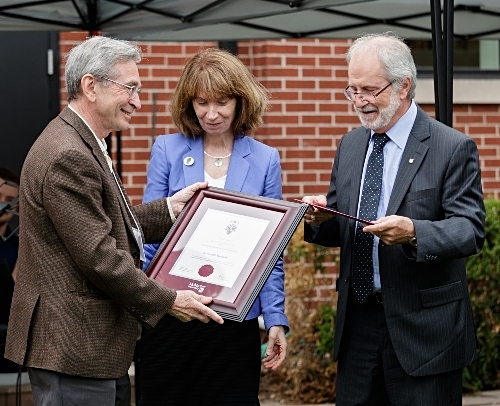 The facility, located across from the University’s Sterling Street entrance, was retrofitted in recognition of the 50thanniversary of McMaster’s acquisition of the Bertrand Russell Archives, the University’s largest and most heavily used research collection. During the event, Lewis also welcomed more than 70 Russell scholars who were on campus to attend the annual meetings of the Bertrand Russell Society, and the Society for Study of the History of Analytic Philosophy, both held at McMaster this year in recognition of the 50th anniversary. President Deane presented Ken Blackwell (left) with the Extraordinary Award for Outstanding Service. Blackwell served as Russell Archivist from 1968 until his retirement in 1996, and has continued to work with the collection as Honourary Russell Archivist ever since. The ceremony included remarks by Nick Griffin, Canada Research Chair in Philosophy and the director of the Bertrand Russell Research Centre, as well as by long-time Russell Archivist Ken Blackwell. McMaster President Patrick Deane spoke about the leadership of then University Librarian Will Ready and McMaster President Harry Thode in bringing the Russell Archives to McMaster in 1968, which was considered a coup at the time. Once a private residence owned by Hamilton’s prominent Stinson Family, the new Bertrand Russell Archives and Research Centre was fully renovated and converted in just nine months. The design and construction was led by McMaster University Library in partnership with McMaster’s Facilities Services and mcCallumSather Architects. The 4300 sq. ft. facility includes a sophisticated climate-control system and compact shelving to ensure the collection is properly stored and preserved; a reading room; and a display room that features items from the collection including Russell’s personal writing desk and armchair. The facility also houses McMaster’s Bertrand Russell Research Centre, complete with offices and a conference room. The Russell Archives, previously housed in Mills Memorial Library, is the largest collection of Russell materials available anywhere. It contains 250,000 original documents written by Russell, 3400 books from his personal library, 3900 volumes of his published works and other scholarly materials, as well as many photos and artifacts including his 1950 Nobel Medal in Literature. The Bertrand Russell Archives and Research Centre is located at 88 Forsyth Ave. N. and is open Monday to Thursday, from 10:00 a.m. to 4:00 p.m..